Never in my life I thought I’d visit Disneyland. But eventually, I did – at Paris to be exact. And it was a great experience! 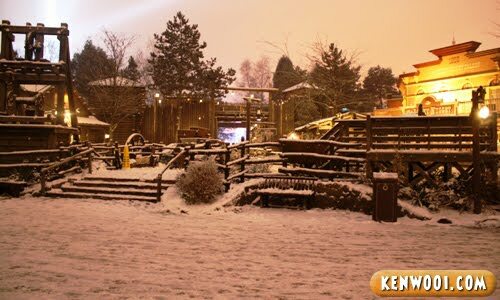 To add more fun to the visit, it was snowing that day too! Anyway, this was my entrance ticket. Printed out after purchasing it online. 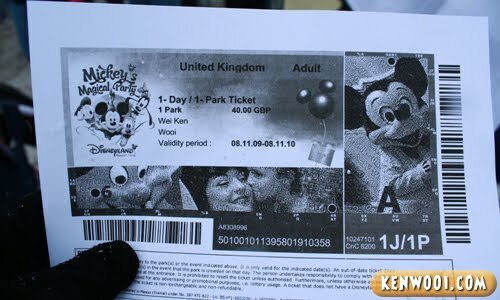 It cost ₤40.00 (RM224.00) per individual to see Mickey Mouse shirtless and Donald Duck pantless live. After reaching Marne-La-Vallee Chessy RER station, we played with snow for a while and then headed to Disneyland, which is about 100 meters away. This was the very first building we saw – which is the main entrance to the Disneyland area. We took spent some time taking pictures before entering. Oh yeah, I’d like to take this chance to introduce the group I was with during this Paris trip. And a bunch of crazy guys. Not forgetting the little Duwayne as well – the youngest in our group. Okay, back to the topic. So after going through the gates, we went straight to Main Street. Welcome to the Main Street – with tracks on the road for the Disney Parade. So this is where the adventure begins in Disneyland Park. As you walk further in, you’ll see the famous icon of every Disneyland – the Sleeping Beauty castle. 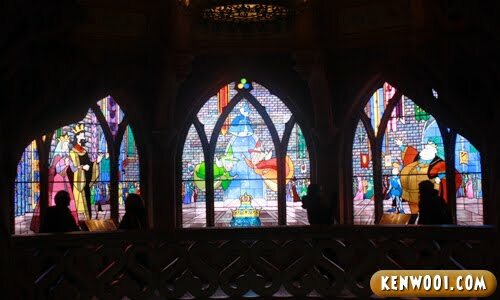 Inside the castle, there are decorations related to Sleeping Beauty. I think the interior glass decoration inside the castle was amazing. 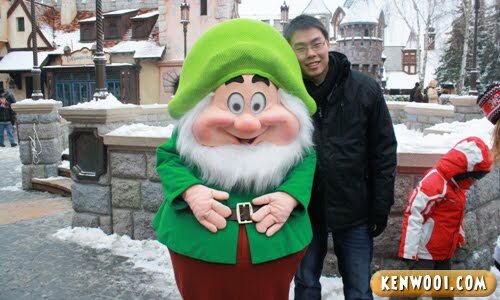 By the way, I met one of the dwarfs from Snow White too. I was happy to meet Happy. Oh wait, is he Happy? I’m not sure but he looks like a happy one. 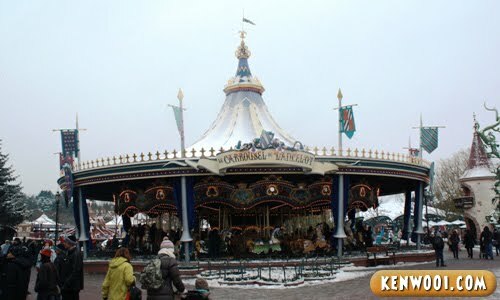 There are rides as well – but they are mostly for kids. No crazy rides to be found. Even if there were, most probably they will be closed due to the weather. 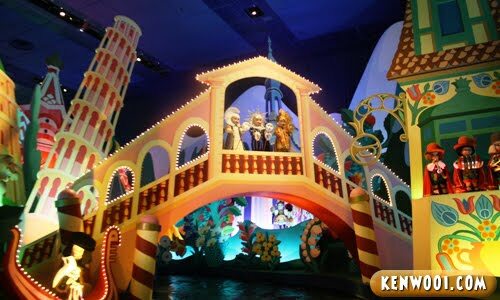 After that, we headed to “It’s A Small World” cruise ride at Fantasyland. That’s the building that sailed us around the world for approximately 5 minutes. I think this represents Italy – with its Leaning Tower of Pisa. Then Egypt. And also a little of Mexican feel. Some Western country as well. The characters and presentation were pretty cute, to be honest. 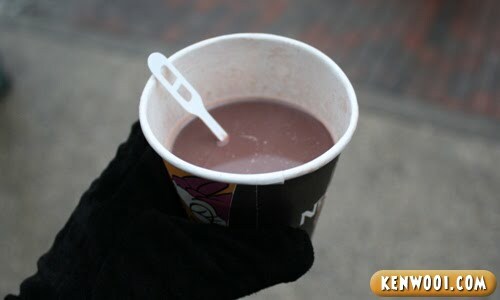 Anyway, since it’s so cold while exploring around the area, you can’t resist to get yourself a hot cup of chocolate drink. I rarely have chocolate drink, but this cup was simply filled with pleasure and satisfaction! Really warmed up the body – but just for a while though. 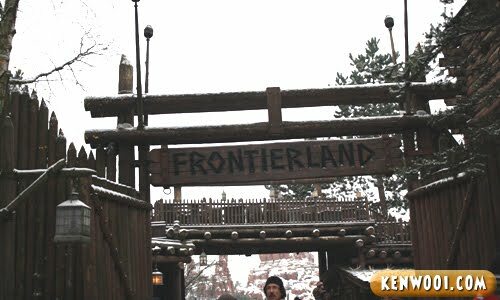 Besides that, there’s a place called Frontierland. 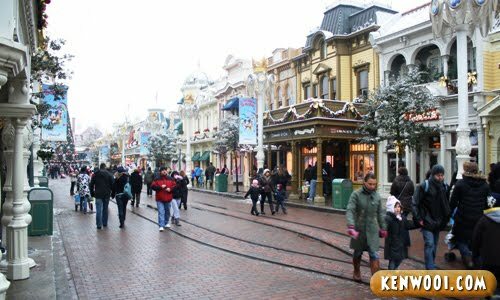 It’s more like a Westernized area in Disneyland. With weird looking rock formation in the middle. More of a cowboy town I guess? 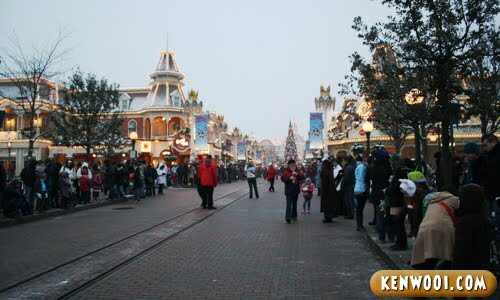 Anyway, as the day started to darken, the lights at Main Street were up – to prepare for the Disney Parade. Everyone was ordered to stand at the side of the road, so that no one will obstruct the oncoming parade. 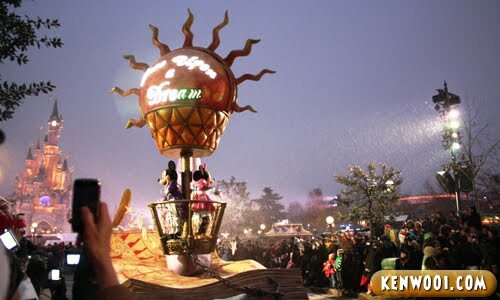 At 5pm, Disney’s Once Upon a Dream Parade started. Mickey Mouse and Minnie Mouse appeared. Kids went excited while I just took photos. Characters from Toy Story – one of my favourite animations when I was young. 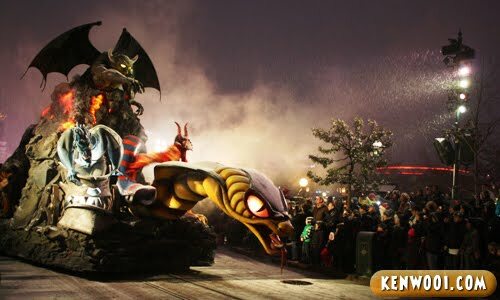 Villains appeared as well – not sure from which animation though. Lion King too. I loved the animation a lot! After the parade, we visited some souvenir stores. 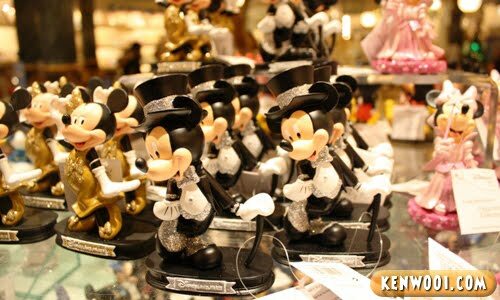 There are lots of gift stores with a huge variety of Disney-related souvenirs. Mickey and Minnie Mouse especially. 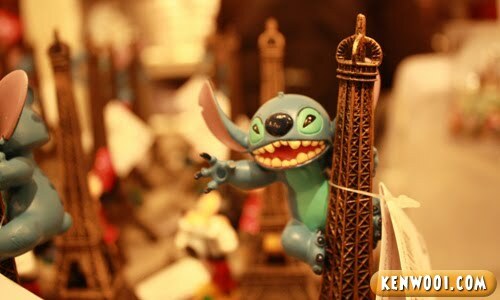 Oh yeah, monstrous King Stitch climbing the Eiffel Tower as well. The day passed by pretty quick, and then we decided to head back. But unfortunately, something unexpected happened. Really made us quite worried and frustrated. But I’ll keep that for another entry. One thing amazing about Disneyland is its night view of the Sleeping Beauty castle. Really a WOW factor! 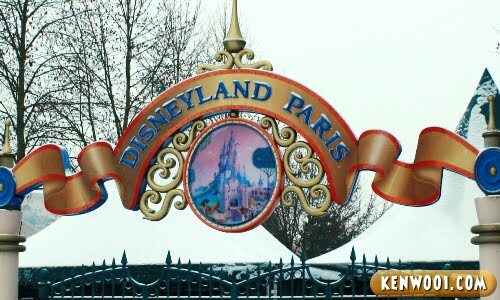 Wow,..there have Disneyland in Paris? and I thought they only have one in US, HK and Japan. The Sleeping Beauty castle is superb. I think one of the villain is the evil witch from Sleeping Beauty. VERY VERY nice pictures there ken! My only Disneyland experience was in Japan.. but I really like your pics!!!! WTF? Paris got DL one ? OMG! It’s so beautiful especially the Sleeping Beauty Castle. Awesome!!! Ahhhh…. I want to go to Disneyland so badly! FMFL! 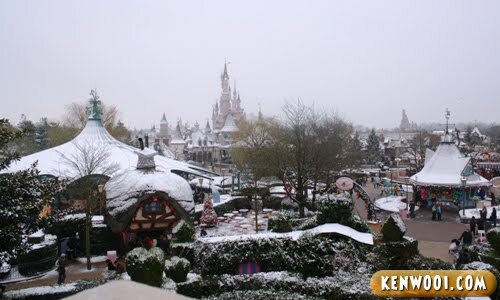 wooh…nice post and also pictures..hehe..
disneyland in paris?…r u sure?not using CGI uh? A wonderful scene of Paris Disneyland! Please have a pleasant week ahead! Awosome!! Journey of a lifetime..its my dream to bring along my kids to this place. Hope become a reality one day..keep on your journey bro because chances rarely comes twice..
my first step to disney was Hongkong.. I was like open mouth.. gaping.. wahhhhh..wahhhhhhh.. 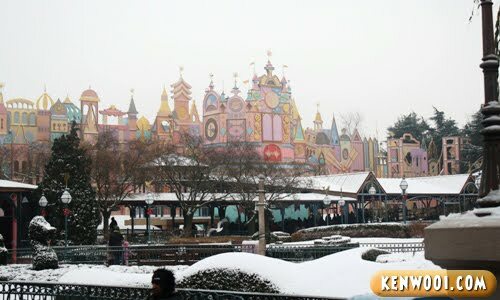 But too bad, no snow as the one u shown above.. sigh.. i wanna visit one more time… if i can.. Wholly mother, punya mahal entrance fee. Well not unless you’re resident there I think it’s okay, but converted to RM is not farnie man. Uh oh, the only Disneyland I went was in Tokyo. That was when I was a kid. I can’t remember much, except goofy’s teeth kena my bro’s head LOL. 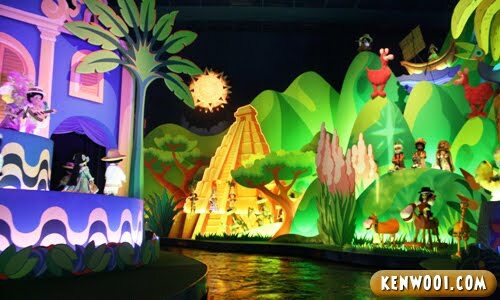 I’m not really a big fan of Disney but I’d definitely wanna go if somebody sponsor the ticket for me. LOL! I love all the Disney characters. When you are at Disney Land, somehow you just become a child all over again. Did you brought back any souvenirs? Love Disneyland!!! Wow!!! You have so many friends over there! Hmmm…you must be a really nice guy, so popular! Disneyland always brings the old to young at heart. Great Disneyland-ing with the whole gang cannot be going alone to such an awesome dreamland. tQ for sharing. Lol!! to see Mickey Mouse shirtless and Donald Duck pantless live. 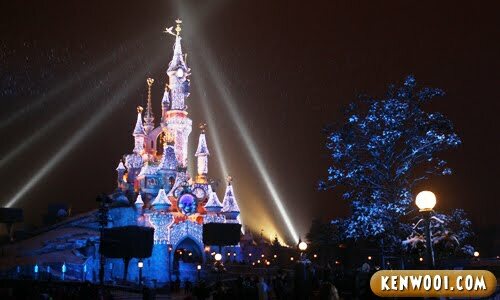 Jaw dropped liao seeing those nice pics…..really love the sleeping beauty castle…really a BIG Wow!!!! 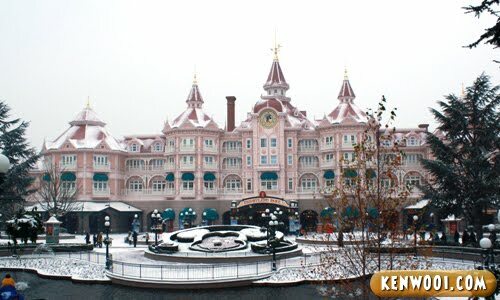 Nice intro of Paris Disneyland ! Wow! I have never been to Disney Paris but I have been to Disney World in Florida. You should go there. I am trying to get myself to Disney Paris to complete my set of Disneys. Dont know when..hehehe. Amazing pictures by the way. Simply awesome. greatly reminded me of my visit to Disneyworld, Florida when I was younger.. wish I can go visit again..
Ahh! I want to go to Paris? I wonder what is the price of the entrance fee? Wahhhhh! Acer Aspire One (Worth RM1299) To Be Given Away! It’s real! Betul-Betul Free Beb! argh…. its my dream too! Thanks Ken, for mentioning us, Duwayne was vry hapy to c himself in yr artical. i am the oldest in the group, but when u r in disney world, u jus don’t care the age. i meet all the dwarf i went into my childhood, hugging n kissing them. Dreams do come thru. is expensive but the worth it. We were in Paris n the best place was the Disney world. Thx Ken for writing this. so you didnt get to play the indoor 360 degrees rollercoaster? No no parents won’t be fed up, “kelvin” they turn into kids like me. i was in my 40ths, but i turn into 12yrs old when i saw all the dwaft, i call all they names n i get sooooo excited until i forgot my kids. thank God got Ken n other big boys n girls were looking after my boy. reply it whenever u’re free. But snow and Disneyland, magical. 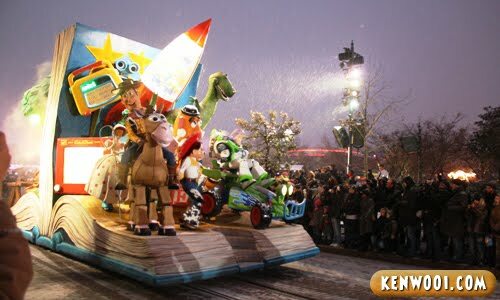 I miss Disneyland Paris… went there 9 years back! well kenwooi.. i was in Paris from 8 april 2010 to 11 april 2010 on a business trip… but due to time constraints.. i missed the Paris disneyland and also missed the half-smiled of Mona Lisa… but the eiffel tower was awesome.. as well as the arc de triomphe!!! A gucci dress cost you 300 euros at la valle paris!!! Owh.. Ok! I’m Freakin’ Jealous Now! 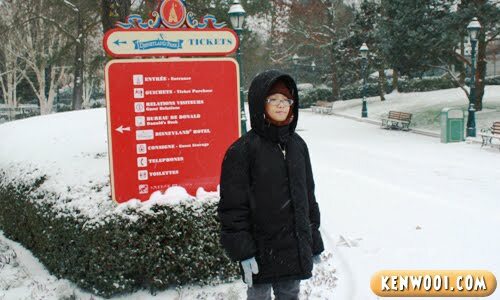 U r so lucky man…..idsneyland oso got go!!! That looks really magical in the winter. You made me smile. The Western part of the united states was referred to as the frontier. 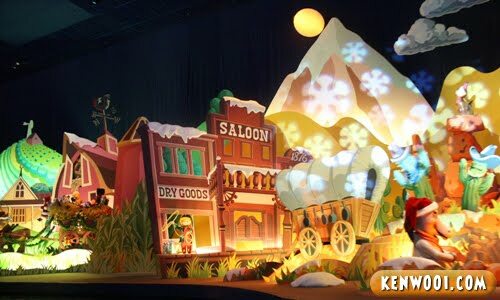 so frontierland is a depiction of the west before it was modernized. (1840’s) The weird rock formations are really mountains and canyon lands. It was fun for me to read someone elses view on that. 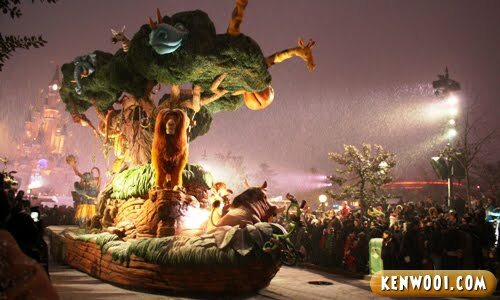 I hope to make this trip to disneyland paris. Thank you for sharing! wow. 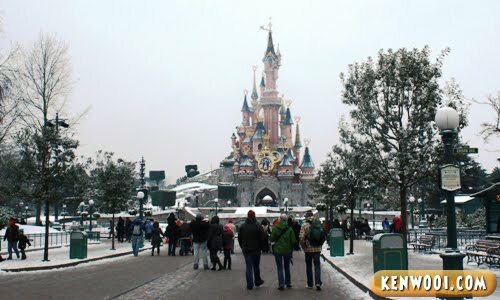 paris disneyland is amazing… last month i went to the disney land in California..
I’ve just got back from Disneyland Paris a couple of days ago, went with my fella and it snowed the whole time!